Events, Patient Stories, Pediatrics, World-Class Care. On World Cancer Day, February 4, Lucile Packard Children’s Hospital Stanford is uniting with the global health community to raise awareness of cancer, educate on its prevention and treatment, and celebrate how pediatric hospitals like ours help kids with cancer heal. Soon to celebrate his third birthday, the day after Valentine’s Day, Cru Silva behaves like any playful toddler. But in October 2017, then 18-month-old Cru was diagnosed with bilateral retinoblastoma after his mom Janelle, who had worked at an ophthalmology and optometry clinic, noticed a glassy reflection in his right eye. Janelle’s maternal instincts immediately kicked in and she made an appointment for what she thought would be a quick eye exam for Cru. After a few tests, the ophthalmologist confirmed two white masses in Cru’s left and right eyes. Suspecting bilateral retinoblastoma, he referred the family to Prithvi Mruthyunjaya, MD, director of ocular oncology at Packard Children’s and Stanford Byers Eye Institute. One week later, Cru, his mom and dad Shane arrived at Packard Children’s, leaving older brother Blaze back home in Maui, Hawaii with grandparents. The diagnosis was confirmed when the hospital’s ocular oncology team performed a careful exam while he was placed under anesthesia. Cru had multiple retinoblastoma tumors in both eyes. Retinoblastoma, a cancer of the retina, is a rare form of eye cancer that primarily affects children under age 3. It is caused by hereditary or spontaneous genetic mutation, with bilateral cases more likely to be hereditary. If diagnosed and treated early, most children with retinoblastoma can live long, healthy lives, enjoying good vision in one or both eyes. 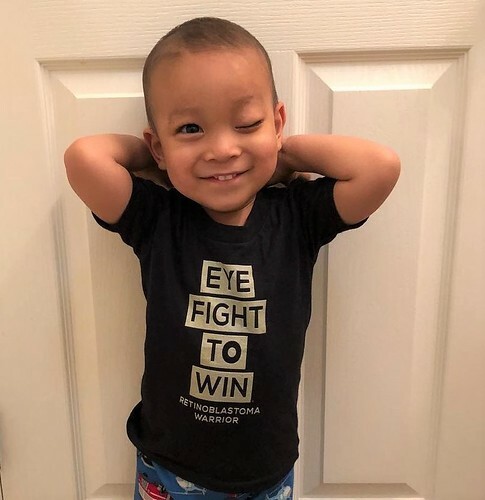 Known as a real fighter, Cru withstood nine months of treatment at Packard Children’s – a “one-two-three punch” of chemotherapy, lasers and cryotherapy – to attack the cancer cells near his eyes. Initially the tumor in Cru’s left eye was extensive; there was a very strong risk that he would have to have his left eye removed. Side effects from treatment kept that eye shut for a month, but Cru never stopped smiling. “We didn’t know we were going to stay at Stanford so long,” said Janelle. “We came with clothes and things for one to two weeks, a month tops.” While Janelle stayed with Cru, Shane tried to fly in once a month and his brother came to visit during school holidays. It was tough being separated, but the family relied on relatives, friends and community, as well as their Packard Children’s care team, to ease their concerns and brighten their days. This support network was vital, as was the optimism the family embraced. As Cru and his family navigated his treatments, his pediatric eye cancer specialty team at the Bass Center for Childhood Cancer and Blood Diseases determined that his eye could be saved while still safely and successfully treating his cancer. After nearly a year of various treatments, the left eye tumors are now inactivated and show no signs of re-growth. By September 2018, Cru’s condition had stabilized enough that he was cleared to return home. He will be examined every 2-3 months at Packard Children’s for the next two years, then every 4 months until age 5. He will also have MRI scans twice a year. Although Cru will require lifelong monitoring, his risk of reactivation declines as he gets older. Due to having had retinoblastoma in both eyes, Cru may be at increased risk of developing other secondary forms of cancer later in life. But he will be followed closely to ensure he remains healthy. During nine months of treatment, Cru’s sunny disposition—and his ability to “take it on the chin” and come out fighting—earned high praise from his team at Packard Children’s. Now home with his family, Cru is as lighthearted as ever, according to his mom. In the Aloha spirit, he enjoys being outdoors and riding his tricycle. When her son is not racing about under the palm trees, Janelle says you can find Cru playing with his toy trucks. His eyes continue to get stronger every day. Cognizant of their good fortune and grateful to be reunited as a family, Janelle and Shane hope to raise awareness of retinoblastoma. They encourage parents to pay close attention to their children’s eye health as they grow and to schedule regular eye exams. Shortly after Cru’s release from the hospital, the toddler’s hometown paper the Maui News shared his story, noting he would throw the first pitch at the Maui Police and Fire Department’s cancer fundraiser softball game. Whether stealing the spotlight on the baseball field, throwing counter-punches against retinoblastoma or playing in the Maui sunshine, hometown hero Cru Silva is using all his superpowers to go the distance against cancer. Cru and all children battling cancer inspire us in the continued pursuit of breakthrough discoveries to treat childhood cancer. Thank you Stanford Childrens health! Cru is such an amazing little boy. He won the hearts of everyone here in clinic with his amazing can do attitude and his beautiful smile. He warmed all of our hearts and would give us fist bumps or high fives when he saw us. His mother Janelle would always give us hugs and was just a joy to be around. I’m so excited to read about Cru’s triumphant battle and wish nothing but love and happiness to him and his loving and dedicated family!